Oh, so very true about our dogs. Recently, I "blew our my knee", and in the stumble, there was my sweet Poppy. When I came home with a stabilizer , and brought up a walker from the basement, she looked at me with such empathetic eyes, and sat with me, head on my shoulder, as I was icing. She knew my pain. When my father was suffering from terminal cancer, our dog was a vital member of his Hospice team (even the nurses said so). She was very in-tune with everything that was going on with him and was able to make him laugh even during this dark time. I can't imagine how much harder his illness would of been without Maggie's support. She was at his side constantly. When he had the shivers, she snuggled up close for warmth. When he was in terrible pain, she never got closer than a couple of inches. Dogs are much more intuitive than some people give them credit for. I don't know what I'd do without my dogs! My aussie has been by my side since we got him 2 & a half years ago. He helped me through one of the worst times of depression in my life while I was still dealing with the suicide of a dear friend. It wasn't until his 2nd birthday that I realized how happy I was & that it was because of him. Most recently, while I was pregnant with my son, I slipped in the shower & he came barreling into the bathroom to check on me. Seeing that I was alright he waited outside the shower most days after that. Also, after the pregnancy, I needed to have foot surgery & have been on crutches. He slowly walks behind me when I am up moving around & even stands in front of the basement steps as I go passed them. I am certain he is making sure that I don't fall down them. He is my best friend (sorry husband!). As soon as he hears me crying, which is alot with a new baby & a broken foot, he is the first one there to crawl in my lap & he makes me pet him. How can you not stop crying with a best buddy like that?!?! After a stroke that took much of my mothers ability to see or remember her way around the house, she told us about our Golden Retriever Beau. Mom was always up several times in the night to use the restroom, but she couldn't remember how to get there. Beau would here her up and go to her. She would put her hand on his head and he would lead her to the bathroom, wait outside the door and lead her back to her bed. He would do the same thing in the morning when she was ready to come to dining area in the morning. We never taught Beau how to lead people, he just somehow knew her needs. He never failed her and we all slept a little better at night. 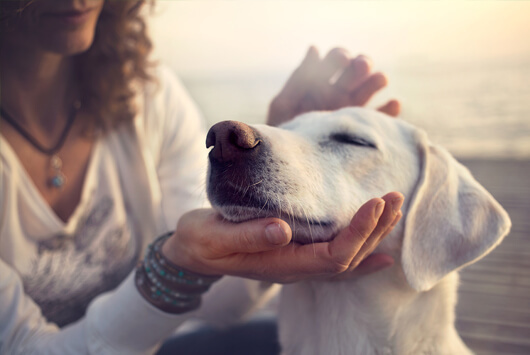 It is wonderful to read about how dogs can help us heal. I am currently working to get my dog Wally certified as a pet therapy dog. I want to bring him to nursing homes and hospitals to visit the sick and the elderly. I know pets can help us in so many ways!